ICLOAK Stik launched its Kickstarter on Thursday, June 26, 2014 for a new portable privacy tool that allows you to browse anonymously on Windows, Linux, or Mac computer utilizing a USB boot drive. This Orlando, Florida based company plans to make privacy easier for those that are less tech savvy with simple to use hardware, like the ICLOAK Stik. Eric Delisle, CEO ICLOAK mentioned at the ICLOAK Kickstarter launch that people are having their information, data, and location used for purposes they are unaware all the time online. Delisle believes you should have a choice on who is looking at your information. Current features of ICLOCK (with more are in the works). ICLOAK will completely mask your IP address. Period. All of your data traffic is forced over TOR or I2P anonymizing networks making you appear to be somewhere else than where you really are. ICLOAK gives you the ability to choose a Country to appear to be coming from. This has many uses including gaining access to content that is blocked in certain jurisdictions. ICLOAK will automatically create a new, random MAC address (this is the hardware identifier for the device you are connecting with) every time you connect to any network. With ICLOAK you can browse anonymously on any 64-bit Windows, Linux or Mac computer without needing to alter those machines. It WILL NOT LEAVE ANY TRACE of your browsing activities on any machine you use. No cookies, no browser history, no user ids, no log files, no registry entries,NOTHING. ICLOAK is immune to any sort of persistent infections so you will be safe from malware, spyware, viruses and any other malicious software each time you reboot. ICLOAK Stik can store encrypted versions of any usernames and passwords you want to keep safe. Also, it allows you to keep separate “identity sets” for keepingmultiple identities separate from each other. ICLOAK Stik can store files on a “visible” section of the USB drive that can be used to store files you want access to on your regular computer OS or transport from place to place. (ICLOAK itself is contained in a section hidden from your regular OS). ICLOAK Stik itself cannot store any information about you or what you do with it. So even if someone steals your ICLOAK Stik, there will be no information on it about you. If you are computer savvy, you might know how to do a few of these tricks already. For those that don’t have a computer science background and feel a little privacy paranoia coming on, you might have found the perfect tool. This could be a great tool for those traveling overseas, those who need to keep location a secret (example: hiding from abusive spouse), or those thinking the government is watching their every move since they log onto the Wifi marked FBI Surveillance Van. 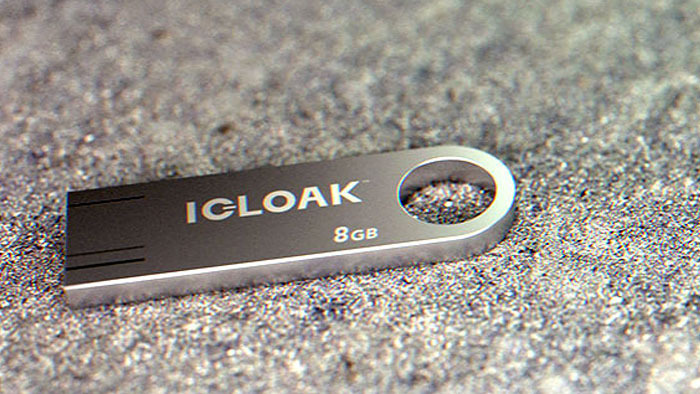 The hardware that will go into building ICLOAK is a robust and high quality USB drive manufactured by Kensington. ICLOAK Stik should lasts at least 3-4 years with daily or regular use. The software built into the USB drive depends on the version you pledge to support. ICLOAK Stik will come with features to enable you to browse anonymously from any machine. ICLOAK™ Stik will contain ICLOAK™ Ring which can be used to store and manage your passwords securely. ICLOAK™ Stik will also contain a separate partition for storage that your regular computer can access. Interested in getting an early jump on the ICLOAK Stik Portable Privacy Tool? Leave a $35 – $100 pledge on the ICLOAK Kickstarter page to be the first to receive this easy to use privacy tool. Eric Delisle, CEO of ICLOAK mentioned that other featured hardware and software privacy tools could be in the works with the ICLOAK name if this Kickstarter campaign is successful. Keep an eye on this product, since only in a few days it has reached 40% of it’s goal.